Indian Prime Minister Narendra Modi said social media changed his life. Visiting Silicon Valley this weekend, Modi sat down Sunday with Mark Zuckerberg at a townhall-style meeting at Facebook's headquarters. Modi, who has 15.2 million Twitter followers and 30 million likes on his Facebook page, said social media is a key tool for diplomacy. He's an avid poster and frequently shares pictures and personal dispatches from meetings and events. Zuckerberg said Modi is "setting an example" for how world leaders should connect with their citizens. But there are about one billion people in India -- or 80% of its population -- without Internet access. Zuckerberg said connecting them is one of "the greatest opportunities available to humanity today." He said it also played a key role in his own education. Modi comes from a poor family and worked as a tea seller in his youth. "I wasn't fortunate enough to get a lot of knowledge, but I was able to make up for that through social media," he said through a translator. "That was how my world was able to move, it brought about a big change in my way of thinking." Modi also responded to concerns that he's not implementing business-friendly refoms fast enough in India. He said there's "unprecedented competition" among India's state governments to lift regulations, and he expects to move up in the IMF's Ease of Doing Business rankings. Evening the playing field for men and women will be another focus of his economic reforms, he added. "We've had a deterioration" in gender equality, Modi said, "but as far as the government is concerned, if we want to achieve our economic goals, then we cannot do that if we imprison 50% of population inside their homes." Modi's trip to the West Coast is the first for an Indian prime minister in 33 years, and his schedule for the 48-hour trip was jam packed. After the Q&A, Modi headed to Google's campus, where he met co-founder Larry Page and executive chairman Eric Schmidt. On Saturday, he visited with Tesla Motors (TSLA) and met with CEO Elon Musk. He also met with Apple (AAPL) CEO Tim Cook, Satya Nadella of Microsoft (MSFT) and Sundar Pichai of Google (GOOGL). At a dinner hosted by the U.S.-India Business Council on Saturday night, he spoke about Digital India -- his initiative to improve technology and connectivity in his country. 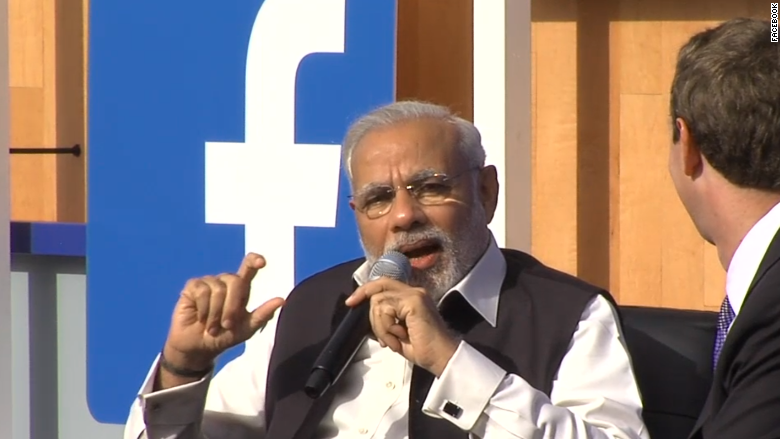 "There may be still some who see the digital economy as the tool of the rich, educated and the privileged," Modi said. "But, ask the taxi driver or the corner vendor in India what he has gained from his cell phone, and the debate gets settled." Ahead of Modi's visit, Zuckerberg changed his profile picture -- and created a filter for other Facebook users to do the same -- to support the initiative.